2018: an exceptional harvest ! Mechanical weeding... but not only! April 2016: Tasting "Champagne For You!" 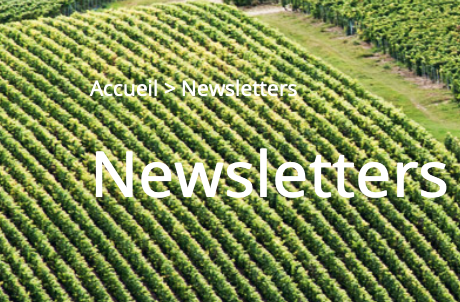 Our NEWSLETTER of February 2019 is at your disposal. Enjoy the reading ! We would like to share with you, through this website, our passion, family spirit and wine grower know-how that has been handed down from generation to generation for more than 300+ years. Based in Charly sur Marne in the Champagne Region's southern part of the Aisne Department near Château-Thierry, our Maison Champagne Gratiot-Pillière is located less than an hour from Paris (half way between Paris and Reims). Our Terroir (land) stretches across15 kilometers of Marne Valley from Charly sur Marne to Château-Thierry. The Pinot Meunier grape variety (emblematic grape of our valley) represents 80% of our planting and harmonizes with a remaining 15% Chardonnay and 5% Pinot Noir grape planting. As such, our cuvées are predominantly Pinot Meunier. Our oldest vines are almost 50 years old! Our 18 hectares (45 acres) of vineyards are cultivated with minimum intervention, by reasoned methods and with great respect for the environment. All of our parcels are planted with grass to ensure comfortable working conditions during rainy periods and to limit soil erosion during major storms. We personally manage all work done in the vineyards to ensure the protection of our beautiful terroir and the production of exceptional cuvées. We offer a wide variety of champagnes: Brut Tradition, Extra-Brut Tradition, Demi-Sec Tradition, Brut Rosé, Brut Millésime, Blanc de blancs and a special cuvée Vieilles Vignes (old vines) called Héritage. Many awards winning! Our champagnes are characterized by their balance, crispness and delicate fruitiness brought on by the Pinot Meunier grape. From our family to yours, we wish you happy tasting…. Let yourself be transported by your senses and enjoy your moments of conviviality to the fullest! Abuse of alcohol is dangerous for your health, consume in moderation.